Daniel Boone was a brave frontiersman who opened the way for settlers through the Cumberland Gap. Read “The Grapevine Swing” by Samuel Minturn Peck. After reading the description of the fort of log homes on pg. 79, build a model out of log planks, or draw an illustration of the fort. Compare your model to this artist’s reconstruction (click to enlarge). Learn more about the buffalo trails to salt licks used by Daniel Boone. Narrate the story of Daniel Boone’s daughter and her friends. Daniel Boone blazed the trail into Kentucky, leading hundreds of thousands of settlers west. Map the Wilderness Road. Throughout Daniel Boone’s long life the frontier was his home, and from his early childhood to his old age his days were full of adventure. It is strange to us now to think of the Schuylkill Valley [Pennsylvania] as being on the frontier, but when he was born there, in 1734, not fifty years before the Declaration of Independence, it was just on the edge of civilization. He was born in a log cabin, and until late in his life he did not live in a less primitive dwelling…. [After marrying, and the end of the French and Indian War, Boone soon] began to think of changing his abode, for there were now many families in the valley, and it is said that he liked his nearest neighbors to be so far away that he could not see their chimney smoke as it curled in the breeze…. In 1769 he set out on the expedition that made him one of the founders of the state…. [H]e and his companions climbed up over the Blue Ridge Mountains, the Stone and Iron mountains, through Moccasin Gap of Clinch Mountain, through Powell’s Valley, up a hunter’s trail through Cumberland Gap until they struck the “Warrior’s Path,” beaten by the feet of generations of Indian war parties, and so down into the forest of Kentucky…. Early in 1775 the first party of settlers reached Big Lick on the Kentucky, by the path which has since been marked out by the Daughters of the Revolution. They began to build a fort, and Boone turned surveyor, laid out the site of a town, later called Boonesborough, and planned the fort. 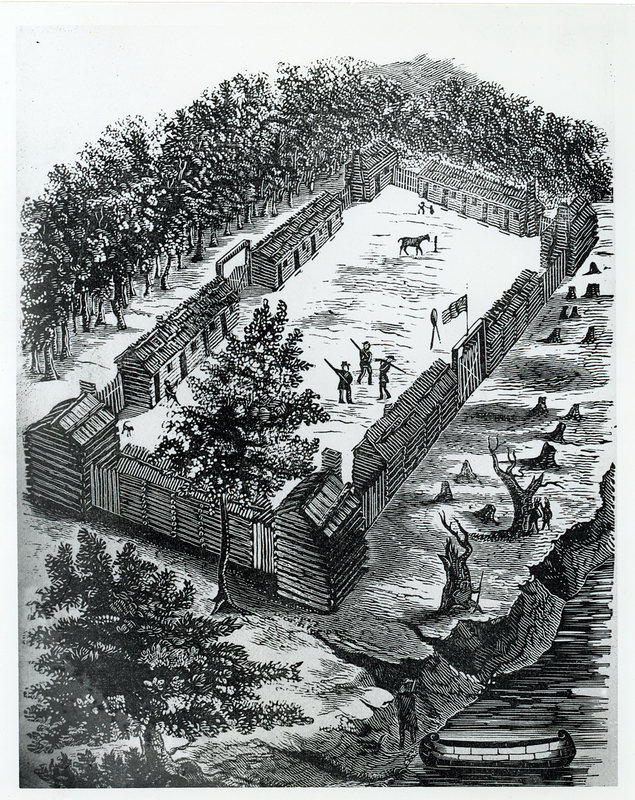 Outside this fort there was a great elm tree, and under its shade the first assembly ever held in Kentucky met to make laws to govern the little community…. For years the settlers in Kentucky endured hardships and suffered many things from the Indians, even after the War for Independence came to an end. In spite of sorrow and hardships, however, the country continued to fill up, and Boone was in great demand as a surveyor. His knowledge of the Indians and his calm bravery and patience made him a tower of strength…. [A]gain Boone felt that he must move so that he might have “elbow room,” as he expressed it. Some members of his family had gone to Missouri and there he followed them, about 1799 with his wife and family and all his possessions. He was very happy for a few years in Missouri. He received a large tract of land from the government, had plenty of room, good hunting, and was made magistrate of his district, an office in which he was very popular. In 1813 Boone was greatly saddened by the loss of his wife. After her death he left the little house in which they had lived for years, and for the remainder of his life was tenderly cared for by his sons. He lived until 1820, always happy and active, going off sometimes on a hunting trip, sometimes working a little on the farm. A timeline from Fort Boonesborough State Park. Background information and illustrations from the Kentucky Heritage Council. An interesting article from the Columbia Daily Tribune written by a Boone relative. Discusses Boone in relation to the salt licks. Interactive map with modern-day sites along the way at DanielBooneTrail.com. Audio dramatization from an the old Cavalcade of America radio show where Boone passes along his stories to the painter of his portrait, Chester Harding. Simple log cabin craft for younger ones at DLTK-Kids.com. Part of the Childhood of Famous Americans series, written by a favorite author. Chapter from A First Book in American History also by Eggleston with narration prompts at the end. Great chapter from Stories of Later American History by Wilbur F. Gordy. Chapter from Hero Tales from American History written by Theodore Roosevelt. Accessible biography in the public domain. Public domain “autobiography” actually written by John Filson. Online book written by a retired member of the U.S. Forest Service covering the long history of the Cumberland National Forest in Kentucky from early exploration, through the Civil War, through the early 1970s. Great historical value! EduPlace.com map for locating Kentucky and tracing the Wilderness Road. NationalMap.com map for notebook, helpful for locating Boonesborough and the Kentucky River. NationalMap.com map for notebook, helpful for locating Defiance.